A pasta dish made with a courgette cheese sauce and topped with tasty breadcrumb covered spinach balls. Blanch the spinach leaves in a pan of salted, boiling water for 1-2 minutes, drain well and refresh in cold water. Using your hands, squeeze out as much water from the blanched spinach leaves as possible, then finely chop the spinach. Transfer the chopped spinach to a bowl and add nutmeg, chopped garlic, breadcrumbs and cheese. Mix well until the mixture binds together. Add more breadcrumbs or more water as necessary, to bind the mixture. Roll the spinach mixture into small balls and place onto a lightly greased baking tray to bake for 30 minutes turning halfway. Heat a few dashes of oil in a frying pan over a medium heat. Add garlic and chilli flakes and fry for 1-2 minutes until softened. Add the grated courgettes and continue to fry for 5-6 minutes or until the courgettes soften. Cook the pasta in another pot with boiling water (add a pinch of salt and 1 tablespoon of olive oil) and cook for 10 – 15 minutes. Add cheese to the courgette pan and season to taste with salt and freshly ground black pepper. Mix until well combined, then stir in some reserved cooking water from the pasta. 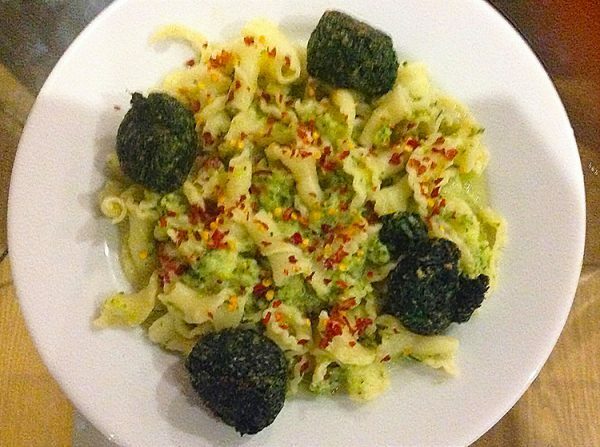 Toss the boiled pasta in the courgette sauce for 2 minutes. To serve, divide the pasta, and sauce equally among four serving plates. Place the baked spinach dumplings on top.